Home » Blog » Use SCANOST.EXE (Integrity Check tool) to Repair OST File Quickly! Use SCANOST.EXE (Integrity Check tool) to Repair OST File Quickly! Outlook is a well-known desktop-based email client and is always connected to the internet during business hours. This makes it susceptible to attacks from malware that can affect the smooth working of a system. It can interrupt communication and even corrupt some important conversation. 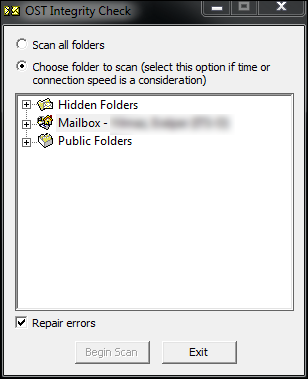 For this, Microsoft has provided an inbuilt tool to repair offline cache(.ost) of an Exchange mailbox. It is to use SCANOST.EXE(Integrity Check tool) to repair OST file. This can be very helpful in times of crisis and can come in handy for any regular or professional user. One can learn all about it in the following post. It sheds some light on the problems faced by many people using Outlook on a regular basis. Some go for a professional software like the OST Email Repair product which is easy-to-use, highly efficient and cost-effective. Find out more in the section below. When creating an Exchange profile, all the mailbox items are stored on the server. This includes emails, contacts, tasks, notes, journal etc. They can be copied and stored in a single database file if ‘Cache Mode’ is enabled. This creates a storage repository that synchronises with the server whenever online. It has an extension .ost and allows users to access mailbox data offline. They can create, save changes and edit messages all with the help of the Exchange OST file. It too is liable to corruption and damage over the years. There is a built-in tool provided for this purpose by the name Integrity Check tool(SCANOST.EXE). 5. Damage to the sector/partition/drive where OST is saved. How to Repair Corrupt Outlook.ost File? 1. First, open Outlook 2007/2003/2002/2000 application on Windows PC. 2. Then, go to Task Manager >> Process tab. 3. Now, Locate Outlook.exe and right-click on it. 4. 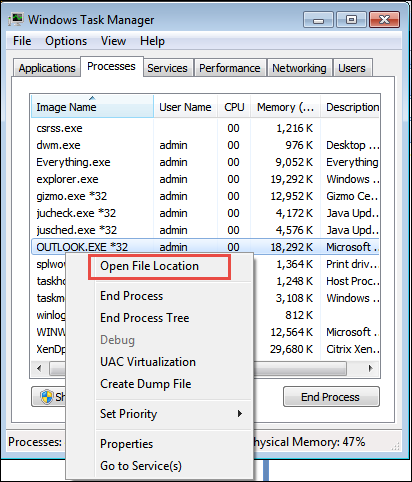 Next, select ‘Open File Location’ to open SCANOST location. 5. Then identify the SCANOST.EXE file and double-click on it. 6. Also, make sure that Outlook application is closed before doing so. 7. From the ‘Microsoft Outlook Inbox Repair Tool’ window, select the corrupt Exchange profile. 8. From the ‘OST Integrity Check’ window, select ‘All Folders’ to scan or choose specific ones from the list. 9. Also, make sure ‘Repair Errors’ checkbox is marked. 10. Then, click on ‘Begin Scan’ button to fix corrupt OST file. 11. Now, the scanning process will be initiated. Let it continue without cancelling it midway. 12. Finally, a message box will appear indicated successful completion. 13. After this click OK. There are important client and customer information stored in an Outlook mailbox. They contain crucial architectural diagrams, financial statements or precious memories stored in media files. Data integrity of these need to be maintained by any non-profit or commercial business. It is need of the hour to have third-party tools like OST File Repair Tool as part of IT toolkit. It is a must-have for those who deal with large volume of emails in an Outlook 2013, 2016. There is no inbuilt utility provided by Microsoft to repair .ost file in these versions. There can be an attack triggered the moment a user opens an attachment from an unknown sender. It corrupts emails, contacts, calendars and complete offline cache without the knowledge of the person involved. When he or she tries to open Outlook, they get errors like Outlook.ost is inaccessible. These are the kind of reasons that one know means to repair OST file using SCANOST.EXE(Integrity Check Tool). There are lots of other ways to make this a lot easier for the end user. One such powerful, automated software has been discussed in this post.